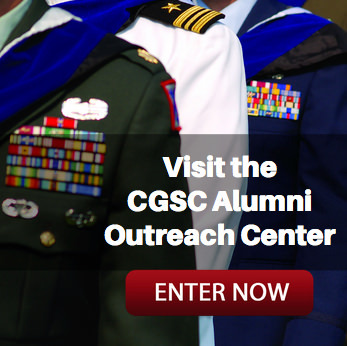 Class of 2019 leaders are ‘Persons of the Month'- September 2018 | Command and General Staff College Foundation, Inc. 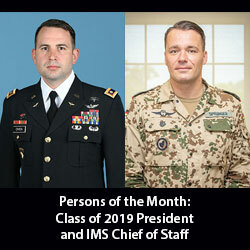 The CGSC Foundation has selected the student leaders of the Command and General Staff Officer Course Class of 2019 as the Persons of the Month for September 2018 – U.S. Class President Maj. Travis H. Owen, and International Military Student (IMS) Chief of Staff, Lt. Col. Thomas Spranger from Germany. According to the CGSC Student Handbook, the class president serves as the spokesperson for the class and assists CGSC’s U.S. Student Division staff in matters pertaining to the class. The class president also guides and directs participation in class projects, social, athletic, community and post activities. From a look at their careers thus far, Maj. Owen and Lt. Col. Spranger are easily well-prepared for their duties as class leaders. 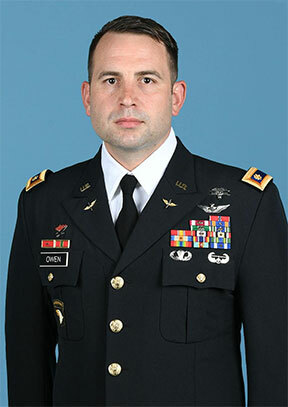 Maj. Travis H. Owen is an Army aviation officer who was initially commissioned as a second lieutenant in the Medical Service Corps upon graduation from the Florida Institute of Technology in 2005. He completed his transfer to the aviation branch in 2016 after his MEDEVAC Company command in the 6th Battalion, 101st Aviation Regiment at Fort Campbell, Ky.
Maj. Travis H. Owen , CGSOC Class of 2019 president. Owen has served as section leader, rear detachment commander, and assistant operations officer for 7th Battalion, 101st Aviation Regiment at Fort Campbell. He also served as the MEDEVAC Operations Officer and company commander for 3rd Battalion, 2nd Aviation Regiment in Camp Humphreys, South Korea and as an Aviation Captains Career Course Instructor at Fort Rucker, Ala. He recently served as an operations officer for 5th Battalion, 101st Assault Helicopter Battalion and 2nd Squadron, 17 Calvary Regiment Heavy Attack Reconnaissance Squadron. He has deployed four times: Operation Iraqi Freedom (2007/08), Operation Enduring Freedom-Afghanistan (2009/10), Operation Freedom’s Sentinel (2015), and Operation Inherent Resolve (2017/18). Owen has earned the Army’s Expert Field Medical Badge, Parachutists Badge, Air Assault Badge, and Senior Aviator Badge. His have accumulated more than 1,200 flight hours, 500 of those in combat zones in support of ground forces. He has completed the AMEDD Officer Basic Course and Aeromedical Evacuation Course; the Initial Entry Rotary Wing Course and UH-60 A/L/M courses; Aviation Captains Career Course and SERE-C. 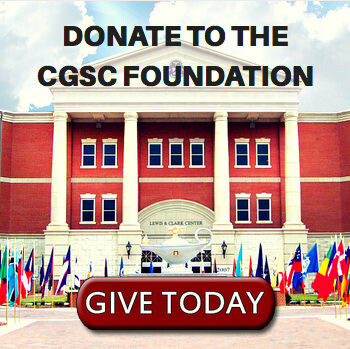 While attending CGSC he is also working on a master’s degree at Central Michigan University. And if that isn’t enough, his time is also occupied with his wife and three children. Lt. Col. Thomas Spranger initially enlisted in the Armored Infantry of the German Army as a conscript on Sept. 1, 2000. He had originally intended to become a history and mathematics teacher after his 12-month mandatory service, but quickly learned he enjoyed military life. He applied for and was accepted into officer training, attending armor school in 2001-02 and officer cadet school in 2003. He was commissioned as a lieutenant in 2004. Lt. Col. Thomas Spranger from Germany, CGSOC Class of 2019 International Military Student Chief of Staff. After his commission, Spranger was assigned to the University of the Federal Armed Forces in Munich, Bavaria, where he studied psychology and statistics. He received his diploma in March 2008 and was immediately assigned as a platoon commander at the German Army Combat Training Center in Letzlingen, Saxony-Anhalt. Upon completion of this assignment he was transferred to the 391st Armoured Infantry Battalion in Bad Salzungen, Thuringia and commanded 3rd Company. During this assignment he deployed his company to Afghanistan for more than seven months, with responsibilities as the Quick Reaction Unit for Baghlan and Kunduz. 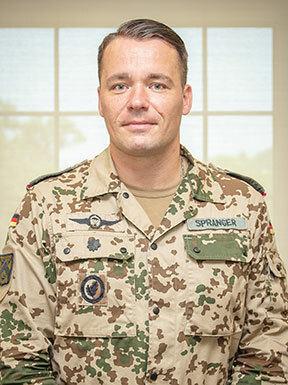 Upon completion of a successful company command, Spranger was assigned as a company trainer at the Live Firing Training Center of the German Armoured Corps in Munster. During this time he was selected to participate in the German National Joint General and Admiral Staff Officer Course from October 2014 until September 2016. He completed the course and was subsequently assigned as the operations officer for the 12th Armored Brigade in Amberg, Bavaria, during which time he again deployed to Afghanistan as military assistant to the commander of NATO’s Train Advise Assist Command (TAAC) North. He also had the responsibility to set the conditions for fielding the German Army’s new “SPz Puma” armored infantry fighting vehicle, a replacement for the SPz Marder. Spranger has said this last assignment was the most demanding of his career thus far. Spranger is married with a 13-year old son and 10-year old daughter and enjoys spending time with them as well as playing soccer, snow skiing, hiking, squash, tennis and the opera. He also helps coach his son’s soccer team. We salute Maj. Owen and Lt. Col. Spranger for their selection to the U.S. Army Command and General Staff College and for their leadership of the Class of 2019. They are truly deserving of our recognition as “Persons of the Month” for September 2018.